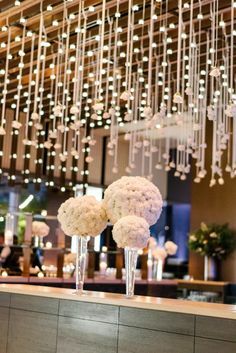 Sophisticated, bold, with a touch of whimsy, dahlias are one of those unique flowers that works well with just about any wedding style. Admired for their large blooms, intricate petals, and beautiful colors, they are a wonderful feature flower to incorporate in bouquets, centerpieces, and arrangements. 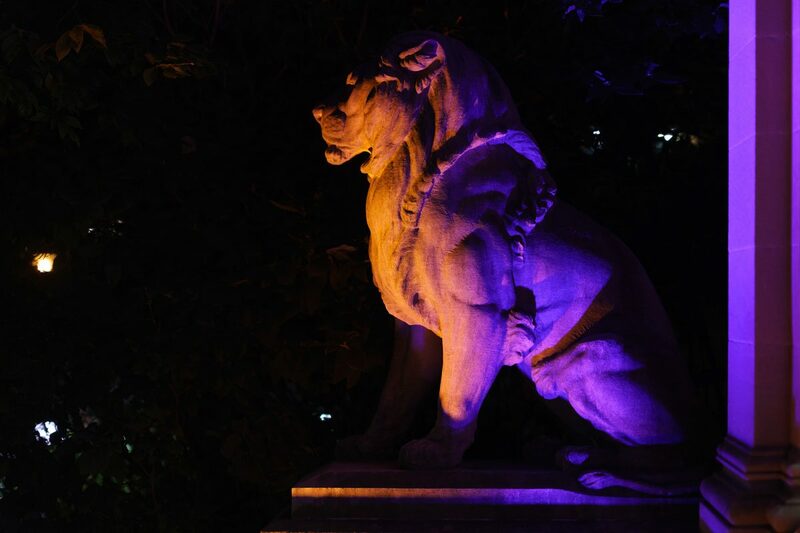 There are many types of dahlias – 42 species in all and each different from the next. 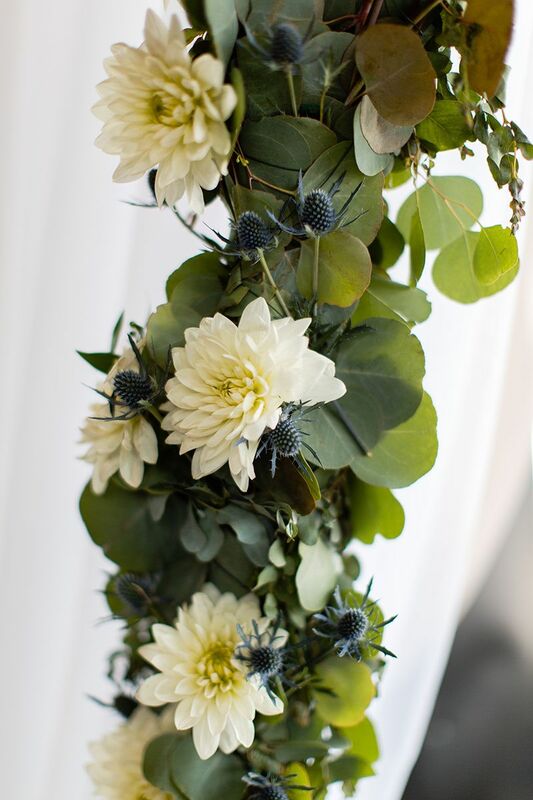 Our brides especially love using café au lait, cactus, and pompon dahlias to celebrate their big day. If there’s one time in your life to wear something that reflects the truest you, it’s when you get married. And not everyone dreams of wearing a long, flowing wedding dress down the aisle. 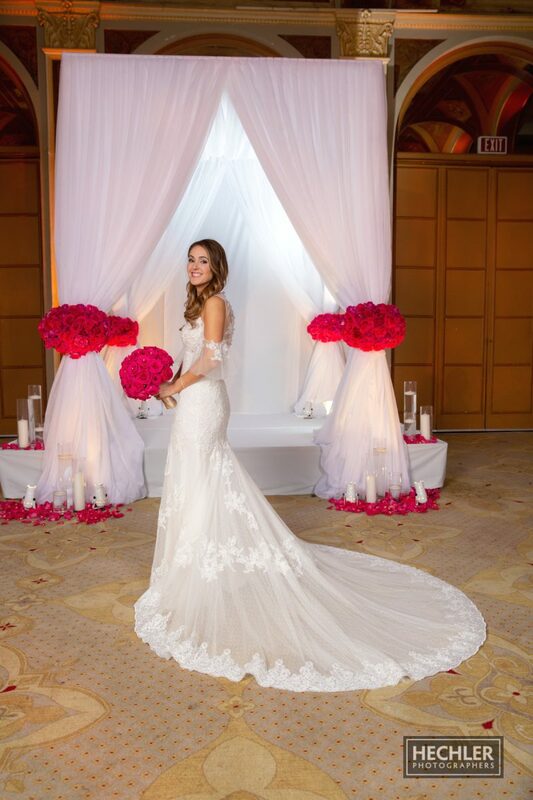 Just ask our featured bride Ashley. 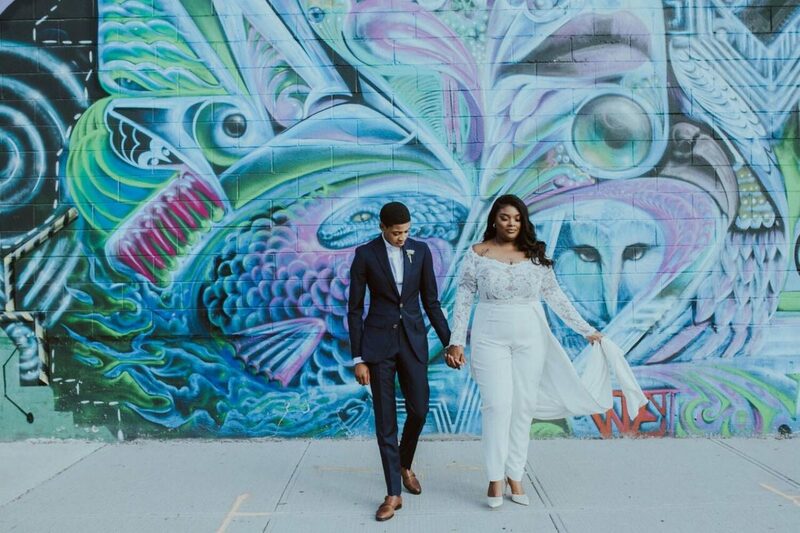 Here, she talks about her stunning Jean-Ralph Thurin ensemble and the personal touches that she incorporated into the big day. 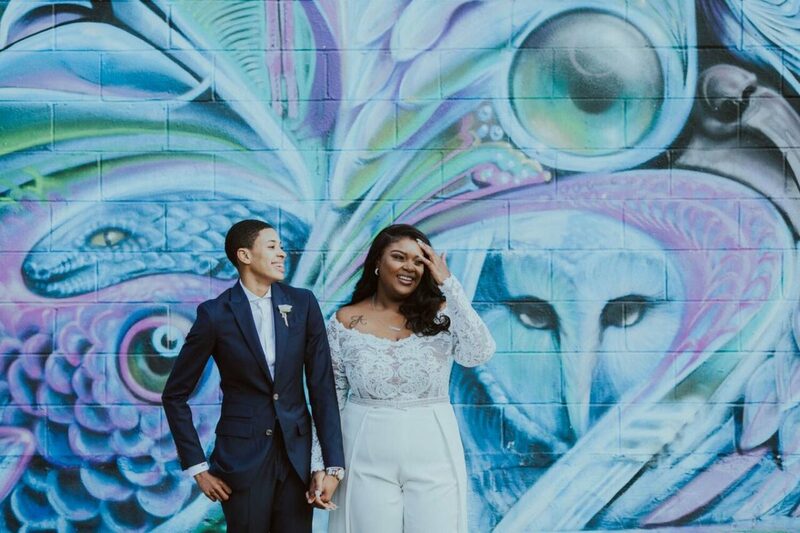 When asked about how she chose her wedding day attire, Ashley begins, “I knew that I didn’t want to wear a dress.” Today, just about every top designer includes a few alternative options for the fashion-forward bride. She continues, “But I couldn’t find anything in the local boutiques. 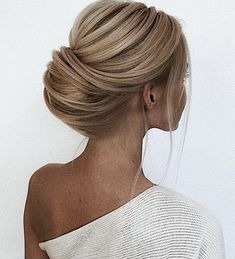 Then I came across the designer Jean-Ralph Thurin and made an appointment at his shop in Somerville, New Jersey.” During their meeting, Ashley detailed what she had in mind and the designer sketched it right on the spot. We are excited to introduce Ashley, our Bride & Blossom Featured Bride for July! Ashley and Tiffany exchanged vows on a beautiful day at The Green Building in Gowanus, Brooklyn. Here is the first chapter in their love story. When it comes to using orchids in wedding floral decor, brides-to-be have much to be excited about. While the Phalaenopsis is the most popular for weddings, there are other types of orchids available such as dendrobrium, cymbidium, and cattleya. Each is uniquely beautiful from the next and can be used in just about every floral decor element. From bouquets to ceremonial structures to centerpieces, here are inspiring ideas for using orchid wedding flowers. The most recognized of all the orchids is the Phalaenopsis. 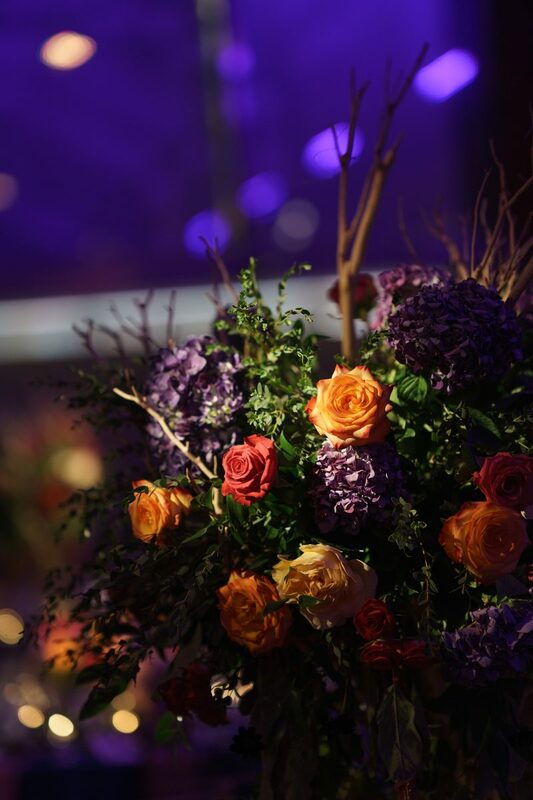 Our brides love this bloom not only for its exquisite beauty, but also for its versatility. 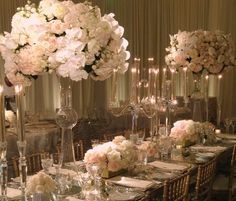 Phalaenopsis orchids can be used in various wedding styles ranging from exotic and opulent to classic to modern. 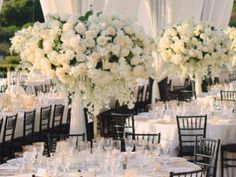 Tall centerpieces featuring lush cream and lavender roses and hydrangea complemented by descending white Phalaensopsis orchids evoke an ambiance of timeless elegance. A bridal bouquet featuring the flower in bold violet with burgundy and red roses captures the eye with dramatic flair. Give the traditional white wedding cake a makeover with a flourish of cascading natural blooms.